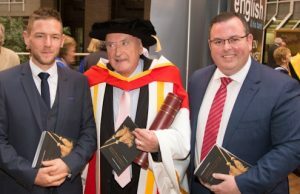 We in Coláiste Phobal Ros Cré would like to congratulate Doctor George Cunningham who recently received an Honorary Doctorate of Letters from the University of Limerick. George received this honour for the enormous contribution that he has made both as a historian and as an author to history in Ireland. George has spent his life preserving and creating books. His contribution to preserving local history in Tipperary and Clare is immense. On Friday 13th of October first year students in Coláiste Phobal Ros Cré were treated to a talk by Dr Cunningham. George has recently donated over 3,500 books to the library in Coláiste Phobal Ros Cré. We are immensely grateful to him for his continued generosity. 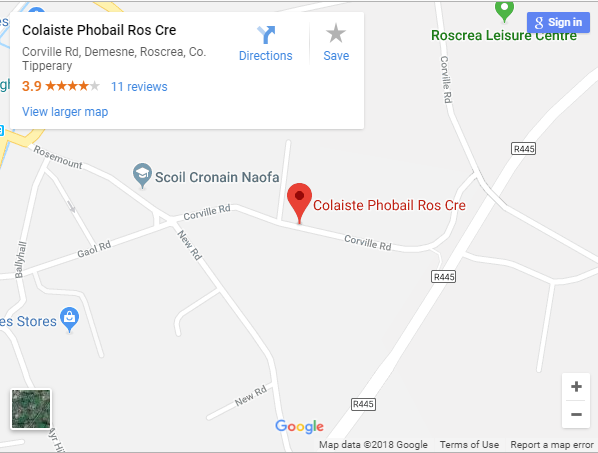 Furthermore, a unique collaboration is underway in creating an archive of local historical sources in Coláiste Phobal which will provide our students with an opportunity to contribute to local historical research. At a functiion in the University of Limerick George Cunningham received an Honorary Doctorate in Literature from Dr Desmond Fitzgerald, President UL. On Saturday the 7th of October Roscrea Minor Hurling Team won the Tipperary County Final for the first time in 33 years. This was a tremendous achievement by both the players their mentors. We in Coláiste Phobal Ros Cré would like to extend our congratulations to all involved. We are very proud of our students who were involved with the team. Students from Coláiste Phobal Ros Cré (past and present)who were members of the squad were as follows: Graham Fahy, Fionn Ryan, Stephen Carey (Capt), Glenn Loughnane, Colman Treacy, Owen Tynan, Liam Seacy, Dan Ryan, Vladislav Bodrovs, Eoin Harte, Darragh Heffernan, Luke Seacy, Aaron Loughnane, Kevin Moore, Darragh Doyle and Conor Nolan. Well done to you all. Tipperary Education and Training Board’s Annual Student Awards Ceremony. Tipperary Education and Training Board held their annual Student Awards Ceremony in L.I.T., Thurles on Friday, 29th September, 2017. The awards ceremony is held annually to acknowledge the outstanding achievements of the students who attended the post primary schools under the remit of the Tipperary E.T.B. 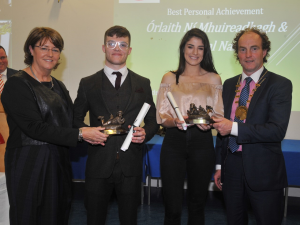 Students are presented with an award and a certificate under the following categories: Best Leaving Certificate, Best Leaving Certificate Applied, Personal Achievement and Best Sporting Achievement. The awards are in recognition of the efforts of students, teachers and schools to achieve continuous improvements and excellence in their academic studies and personal development. Students from Coláiste Phobal Ros Cré to receive awards on the night were William Cummins, Órlaith Ní Mhuireadhagh, Abigel Nagy, Cathal Nash, and Laura Walsh. 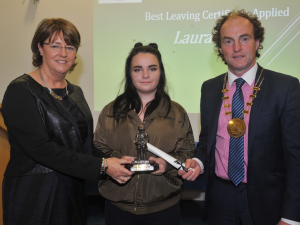 Laura Walsh received the award for Best Leaving Certificate Applied Student from Coláiste Phobal Ros Cré. Laura commenced her education at Colaiste Phobal in September 2012. From the onset she proved to be a dedicated student who worked hard to reach her potential. She displayed an excellent work ethic, being consistent in her studies and always meeting deadlines. The Leaving Certificate Applied programme provided many opportunities for Laura to demonstrate her leadership capabilities through her active role on the Student Council. Throughout the programme she demonstrated that she had an excellent relationship with all her teachers and supported her classmates whenever the opportunity presented itself. Overall Laura was an excellent student who took great care with all of her tasks and key assignments. Throughout her years in Coláiste Phobal Ros Cré Laura was an absolute credit to her mother Caroline, the school and indeed herself. She was a most worthy recipient of the award and epitomised what the Leaving Certificate Applied programme is all about. 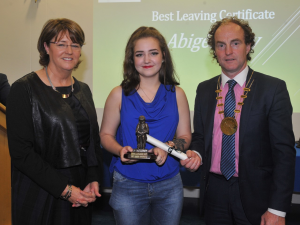 Abigel Nagy received the award for Best Leaving Certificate. Abigel started in Coláiste Phobal Ros Cré in September 2011. From the outset Abigel committed herself to her studies. Even as a bright-eyed, bushy-tailed first year, she had an uncanny determination to succeed and possessed a single mindedness that was admirable for her age. This determination grew over the years and the focus on her studies never wavered – she consistently received good results in her school assessments throughout her six years and performed extremely well in her Junior Certificate. Abigel is blessed with many talents. She is extremely artistic and was a major asset when called upon to prepare backdrops for our school musical. She delights in music and participated in many different musical activities. Our religion department welcomed the innovation and flair Abigel brought to the planning of our school liturgy services. She displayed diligence in everything she did and expected standards for herself, but was always modest about her achievements. Words like kindness, empathy, strength, good humour could all be used to describe Abigel. Abigel faced life every morning with a smile and teachers concur that “she was a delightful student to teach”. We at Coláiste Phobal Ros Cré were privileged to have Abigel as part of our school community for six years. She was the perfect role model for our students and we wish her health, happiness and success in the future. William Cummins received the award for Best Sporting Achievement. During William’s six years in Coláiste Phobal he exceled in many areas with one of note being his badminton abilities. William started in first year as a beginner but improved at a rate of knots winning county titles for the Coláiste at the various age groups. He was dedicated to his sport from the start always willing to listen and attend training. As a result, he made great strides in the sport as he progressed through the school. He was always very determined and led by example. William was part of the division 1 All Ireland runners up team of 2015, in 2016 he was a member of the victorious All Ireland team and runner up again in 2017. On top of that success at club level William has gone from strength to strength working his way up through the ranks winning numerous singles, doubles and mixed titles. Throughout his time in Coláiste Phobal Ros Cré William was an excellent student and we in Coláiste Phobal Ros Cré wish him every success in the future. Órlaith Ní Mhuireadhagh, Head Girl, and Cathal Nash, Head Boy for 2017, received a joint award for Personal Achievement for spearheading “Hope Week” in Coláiste Phobal Ros Cré. When the idea for a positive mental health week was rooted for January 2017 Cathal and Órlaith rose quickly and undertook pivotal leadership roles. Órlaith and Cathal chaired the weekly meetings as well as planning, organising and undertaking the administration work from September onwards. Taking on a new, unchartered project required grit, nerve and determination. During the “Hope Week” innovative activities like yoga, mindfulness, Fun Friday, a thought provoking talk from Finbar Walsh, acoustic gigs, Dreoilín sessions and free hot chocolate mornings ensured the week was a huge success. Indeed, the HOPE Group was awarded the Tipperary Garda Youth Achievement Award in recognition of their achievement. However, it was Cathal’s and Órlaith’s leadership throughout the week that impressed everyone in Coláiste Phobal. Cathal’s drive, encouragement of others and optimism energised the group; he was the perfect role model for younger students in the Coláiste. Órlaith’s thoughtfulness, steadfastness, perserverance and attention to the finer details ensured the whole process ran smoothly from start to finish. Both worked with courage and clarity which was in total keeping with the essence of what the week was about – bringing HOPE. What’s lovely about Órlaith and Cathal is that what they did – they did from the heart! They never sought any accolade or recognition and without them “Hope Week” would not have had such a powerful effect on our school community. Because of Hope Week, many of our students are taking steps to mind their mental health. Because of Órlaith and Cathal, our College learned the lesson that heart-warming things happen when good people come together. Congratulations to Abigel, Laura, Cathal, Órlaith and William on your awards. Everyone in Coláiste Phobal Ros Cré is very proud of all your achievements and wish each of you every happiness in the future.